It’s getting to be that time of year. 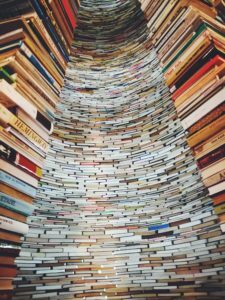 The time when we (I) look at our valiantly attempted reading challenges, shrug off the incompletes, and look ahead to a fresh new year with fresh new challenges. Finding them really couldn’t be easier, since Feed Your Fiction Addiction has already done the work and compiled a Master List of 2019 Reading Challenges. I’m a big fan of list-based challenges (Read Harder, anyone? ), so I’m intrigued by Around the World in 52 Books and the Reading Women Challenge. The Victorian and Georgian Challenges would combine nicely with my personal Classics Club list. And I’m just tickled by having the option of a list or a BINGO card for the Victorian one. That’s a nice touch right there. I love a cozy mystery, and both Craving for Cozies and Cruisin’ through the Cozies look like fun. 12 Children’s Classics is a book-club style challenge with a set sequence of books assigned to months. February is Lamb’s Tales from Shakespeare, which happens to be on my Classics Club list. Speaking of children’s books, there are challenges for both middle grade and picture books hosted at Becky’s Book Reviews. I may feel a tiny bit called out by the Blogger Shame Challenge. My NetGalley feedback rating says I should do this challenge. And then there is the Reading Challenge Addict Challenge, wherein one takes a challenge to complete a number of challenges. Wonderfully meta!